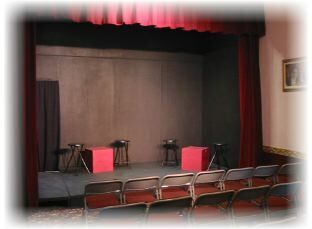 An intimate theater specializing in new plays, melodramas, improvised theater, acoustic music, and Vaudeville style variety shows. Our concessions stand features over 60 types of old fashioned candy! We have salt water taffy, candy sticks, root beer barrels, Mary Janes, and old fashioned candy bars. Hard candies and soft candies and even gum and cold drinks -- brands you didn't know were still available. We produce the North Park Playwright Festival each year, featuring new, short plays by playwrights from around the world. We also teach the STARS theater arts program for individuals with developmental challenges. Click the buttons below or contact us for information on our shows and programs.